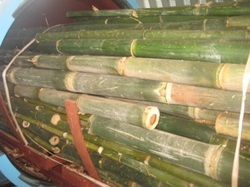 Whispering Winds Bamboo, in cooperation with the University of Hawaii’s entomology department, tested six species of clumping timber bamboos grown at their farm in Hana. WWB was interested in establishing data about any inherent resistance to wood destroying insects. The samples tested were harvested from six-year old clumps and the individual poles were at least 3 years old. Surprisingly none of the species tested showed significant resistance to termite attack. Two species of termites were used in the tests and the following documents summarize the results of that laboratory work. This work was funded in part by a grant from WSARE (Western Sustainable Agricultural Research and Education) and the University of Hawaii’s entomology department. Special thanks goes to Dr. Ken Grace and his students who did the lab work. The report stated that, "the two most resistant bamboo species, Gigantochola pseudoarundinacea and Bambusa oldhamii, demonstrating significantly greater resistance to termite attack than the most susceptible bamboo species...". Download the full test results here. Then please take a moment and download and fill out the survey based on the information you gained from reading the test results. You can print and mail it back to us at Whispering Winds Bamboo HC1 Box 180 Hana, Hawaii 96713 or you can scan and email it to us at wbb@starband.net. Your kokua is very appreciated in helping us to fulfill our outreach goals of the grant by filling out and returning the survey. We believe this to be a first step in understanding the nature of bamboo in the post-harvest phase, and hope to obtain more funding for more studies. Rich von Wellsheim for the gang at WWB. It’s hot, lush and peaceful at the Waiawa Correctional Facility, a sprawling 195-acre property that looks out on the ridges of the Waianae mountain range. Sweet corn, green onions, lettuce, tomatoes, squash, cucumbers, cabbage, beats and cherry tomatoes are grown by as many as a dozen inmates who work 35-hour weeks. “It’s better than being caged up in Halawa. It’s hard to get sun,” said Ricky Kenui, who is in his early 40s and serving a 10-year prison term for stealing a van with tourists inside. The facility is one of a few state prisons, along with the women’s prison in Kailua and the community correctional facilities on Oahu and Kauai, that have farms. Hawaii prisoners are growing 25 percent of the produce consumed at the state’s seven prisons, according to Toni Schwartz, spokeswoman for the Hawaii Department of Public Safety. But some say the system could be doing more and that if inmates grew more of their own food it could bring down the cost of housing prisoners in Hawaii, making it possible to bring home some the 1,900 Hawaiians housed in Arizona, where it is cheaper for the state. 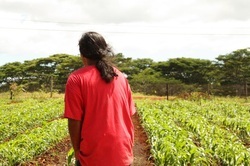 “The land is just sitting there going fallow,” said Glenn Martinez, a local farmer and owner of Olomana Gardens in Waimanalo, who has been outspoken about the benefits of expanding the farming programs. Currently there are no initiatives to expand the programs that have shrunk over the years, but Gov. Neil Abercrombie has been a strong supporter of local food sustainability and bringing prisoners from the mainland home. "During tough economic times there are a lot of initiatives that the Abercrombie administration has been moving forward on and this would fall in line with that," said Donalyn Dela Cruz, the governor's spokeswoman. The low-security prison at Waiawa that houses 334 inmates is one example of where more could be done. Scott Harrington, the warden, said he envisioned raising cattle. Formerly sugarcane land, the Waiawa farm includes an aquaponics portion that uses tilapia and catfish through a closed-cycle system to fertilize a vegetable garden. A wide diversity of crops are grown in the field below. But the farm has been scaled back from seven to four acres and its workers cut in half because of a lack of money. Milton Saito, who runs the farm, said he was hoping to expand it, but doesn’t have enough funding from the state – he said he hoped private sources could step in. In addition to providing fresh, local food for prisoners and reducing food costs, prisoners interviewed by Civil Beat said that they liked the work and the chance to be at Waiawa. The facility lacks the high walls, barbed fencing and guard towers of high-security prisons, and has an intensive drug treatment program and educational classes. Prisoners come to Waiawa as a reward for good behavior. While pay at the farm is only 25 cents an hour, Tama Taosoga, another inmate who worked on the farm said that it felt good to be active.